In the beginning of the year I set a lot of expectations. 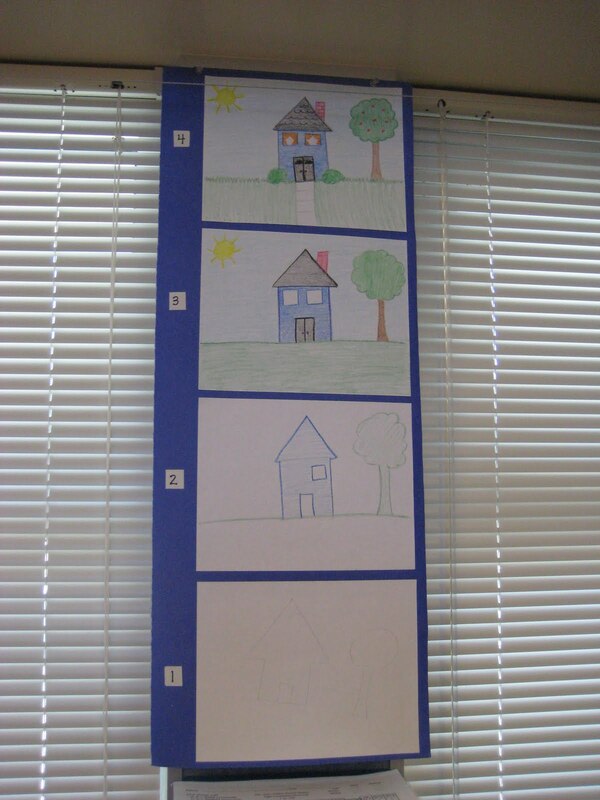 One of the tools I use is a picture rubric to show what I expect when it comes to drawing. It is hard to see in this picture but the bottom drawing is a sketch of the house in pencil. I do a mini-lesson on adding detail and color to your drawings. I ask the students to tell me the differences they notice between each level. First graders are so precious, they always tell me I am such a good artist. LOL, I wish! Often in the beginning of the year I will refer to the chart and ask, "What can you do to make your drawing a 4?" It isn't long before they are saying, "Look Mrs. B, I added birds flying in the sky to make my picture a 4!" I just posted about this on my blog with a suggestion for everyone to look at what you did. This is such an awesome idea! Thank ypou for posting it! Wonderful idea. Thank you for posting. I will definitely be using this. Superb idea!!! I am going to have to try it!!! Great idea! I think I might try this in my class this year! Love it! So simple and concrete for the kiddos! I really like this idea! I teach 3rd grade and assume my students know how to make a "good picture." I definitely think this will help us. Thanks for sharing! We do a ton of guided drawing as part of our writing program called Write from the Beginning. By the end of the year I am amazed by the details in their work.I love how you displayed this sequentially. Thanks for this idea. Thank yo so much for that! I am always struggling with how to make my kids take more time on their drawings. I did almost the same thing! At the end of last year I had a few kids color pictures for me, from really bad scribble scrabble to lots of color and details. But I had them use a coloring sheet so my rubric is really for coloring and not drawing. But every year I have the kid who scribbles every picture red when I ask him to color his sheet. I think the rubric is really going to help. I love yours! I also plan on making a writing one that ranges from an incomplete sentence with no punctuation, spaces, or regard to capital/lowercase to a neat complete sentence or two with all the correct mechanics. Great motivation for youngsters! Thanks for sharing! AWESOME idea!!! I so need to do this! It drives me NUTS when kids only give half effort on their drawings even though I know they can do more! I am soooooooo doing this! Thanks! Between this and "The Crayon Box that Talks" I'm bound to have more effort this year!!! Thanks for always sharing! This is great! Thank you for the idea. I always try to get more out of my kiddos when it comes to coloring and drawing. A rubric--A-HA! Thanks so much for sharing! :) Love this idea! Duh! I've used rubrics for everything...except for their pictures...Thanks for the super idea! 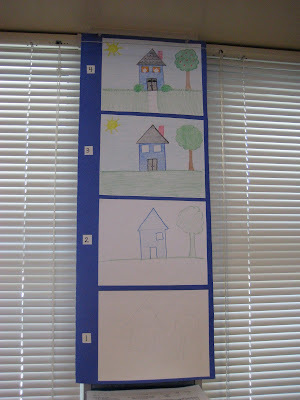 Oh my gosh, not only is this a great idea to help children with their drawings; it is a GREAT way to introduce rubrics. Well done Jenn! That is such a simple yet effective idea; I love it! Our art teacher has a similar rubric hanging in her class, yet it never occurred to me to make my own! I am definitely going to work on my own today (before I forget!). Thanks for the great idea Jenn! I love this. What a wonderful idea. I am going to copy you, although I thought about adding writing beside it. #1 would be a simple sentence leading to #4 being a detailed sentence. Did you put this in Pinterest? I love to save anchor chart ideas in Pinterest. Barbara-I didn't use a pocket chart. I just used butcher paper and laminated. Kristi-LOL, I don't pin my own ideas but you are welcome to! One of my Kindergarten teacher friends uses a very similar rubric to show kids how to add detail to their writing. I have the same thing but it also has words at the bottom to show that progression from adJufHL8ug to I se a hows. What a fantastic idea. I would have never thought of coming up with a way to visually explain standards for drawings. Really, really clever! What a great idea! I adapted it to our 6pt. rubric, and will use it with my class. THanks!